Surf Dog's 100% oxo-biodegradable poop bags help you clean up after your dog, and as the bags will completely decompose over time they are good for the planet too. They come in a box of 3 rolls, with 12 bags per roll with easy tie handles. They go really well with Surf Dog Australia's Pookey Bags, as they dispense from the lid of the bag. We find these poop bags perfect, as they have handles, which makes them easy to carry. 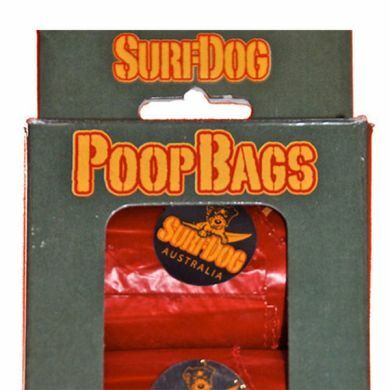 We have not been able to find any poop bags with handles in pet shops or supermarkets. Also, the fact that they are biodegradable is an added plus. 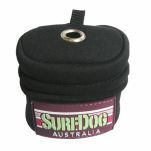 Read 3 customer reviews of Surf Dog Australia Biodegradable Poop Bags. The average customer rating is 3.7. The pros: Good size and has handles. Cons: The bags don't tear apart as they're meant to. Scissors are required. For me because of that I wouldn't buy again. The only negative is the pull apart serrations do not work. We have to use scissors.